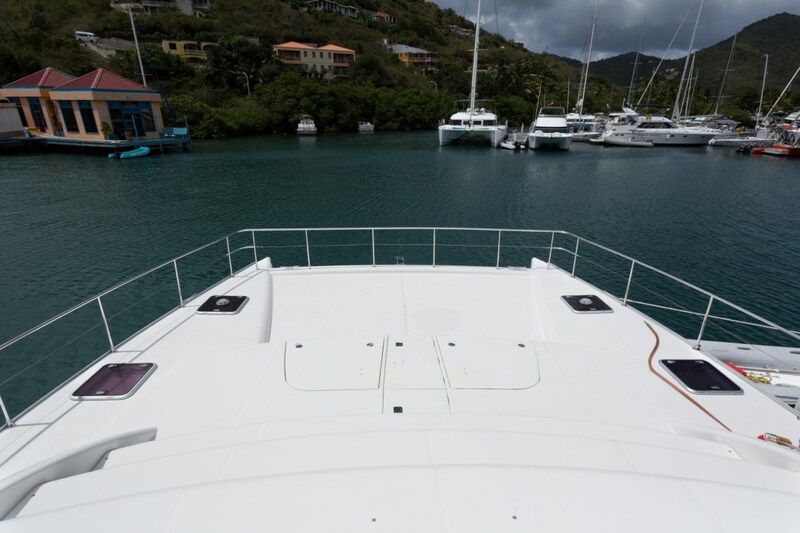 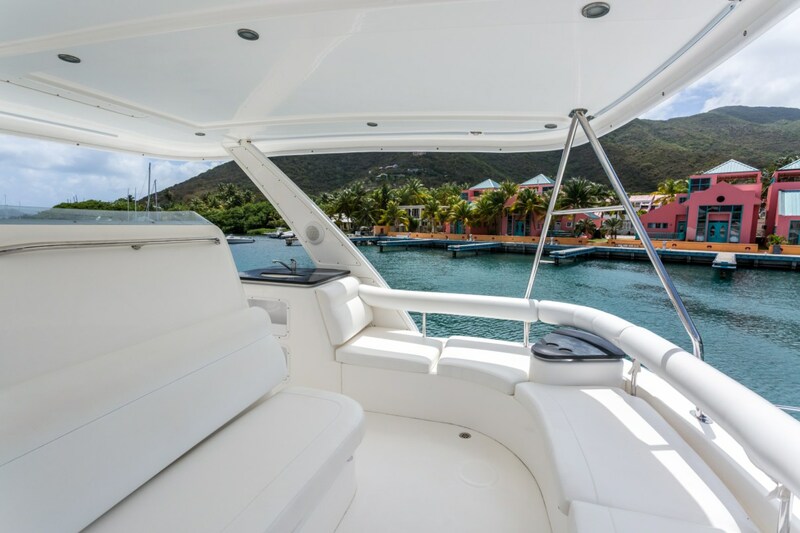 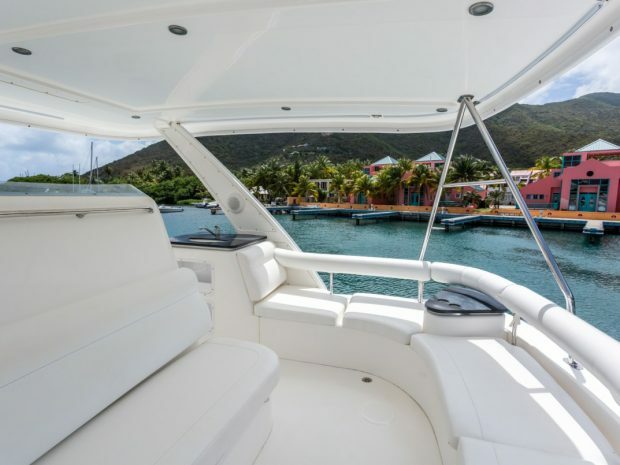 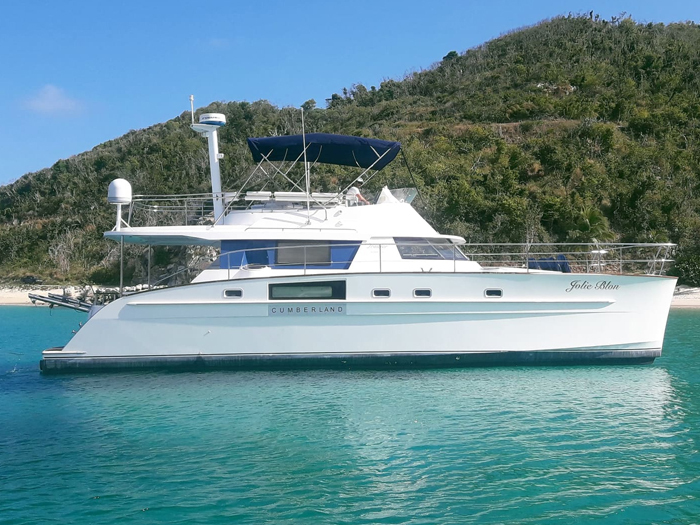 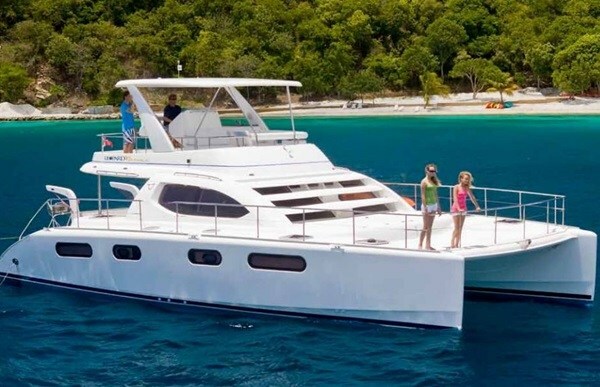 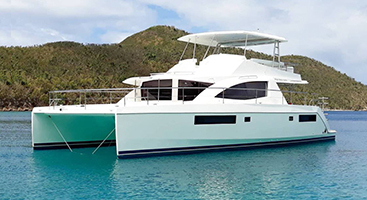 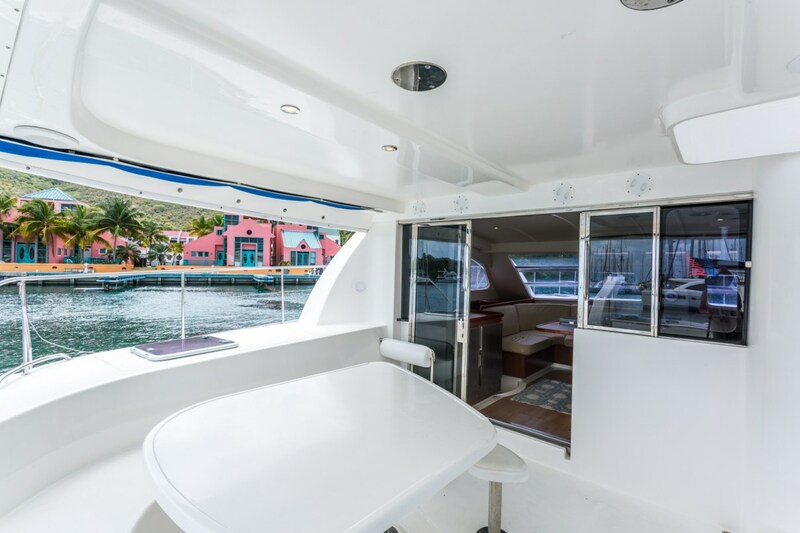 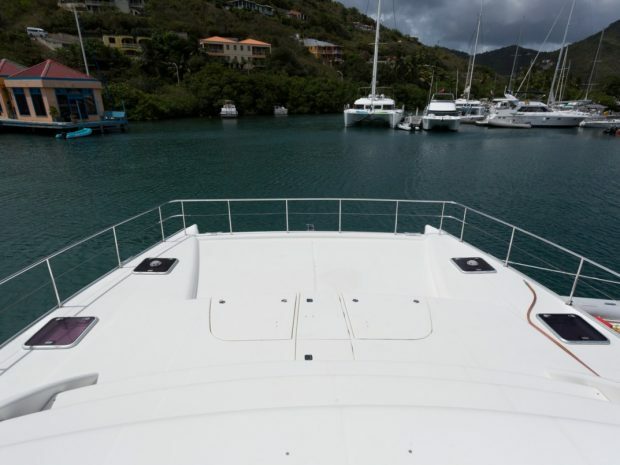 The Leopard 47 power catamaran, ‘Jenica’ is the perfect balance of contemporary design, charter comforts and open space for your entire group to relax while cruising around the beautiful BVI! 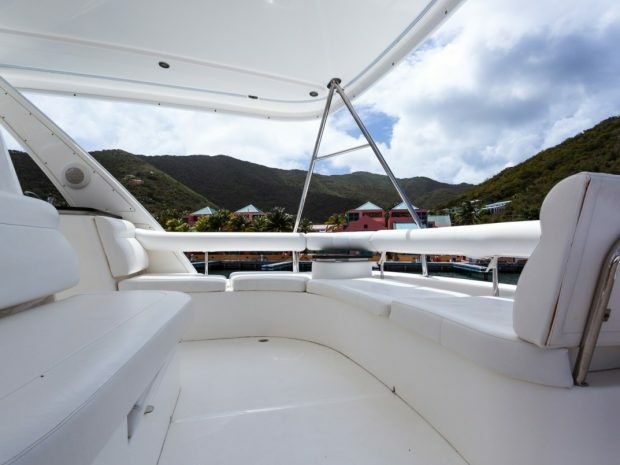 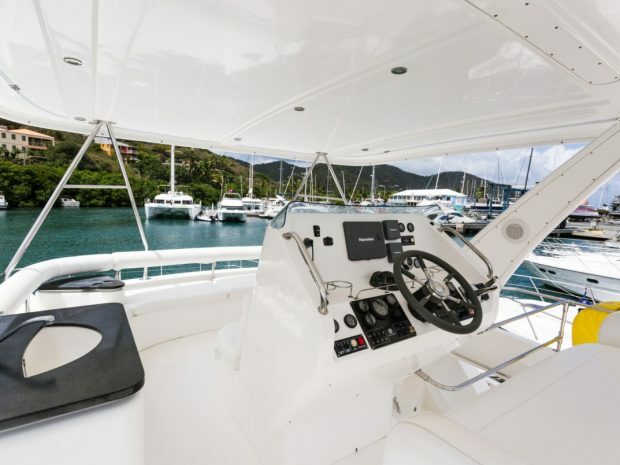 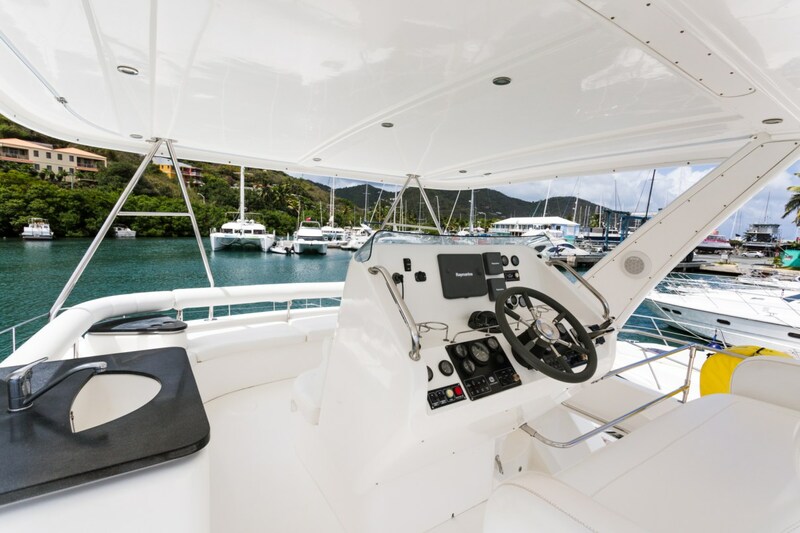 The top level of a Leopard 47 is a the spacious flybridge. 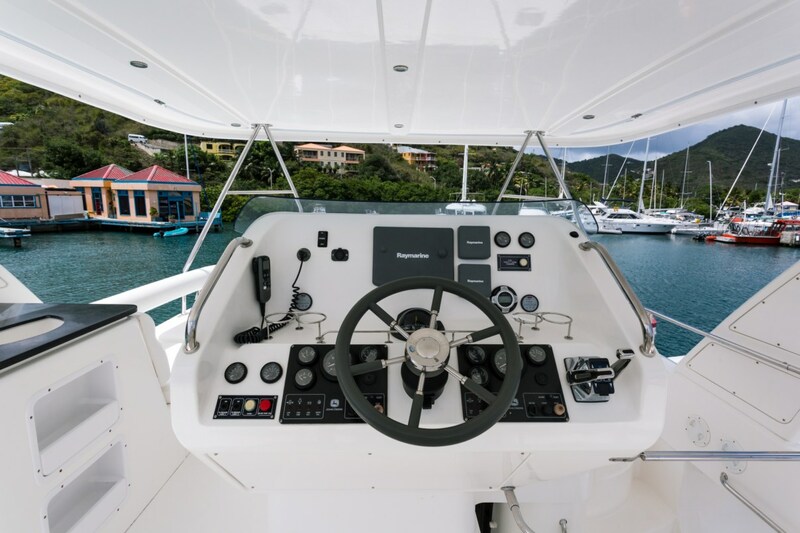 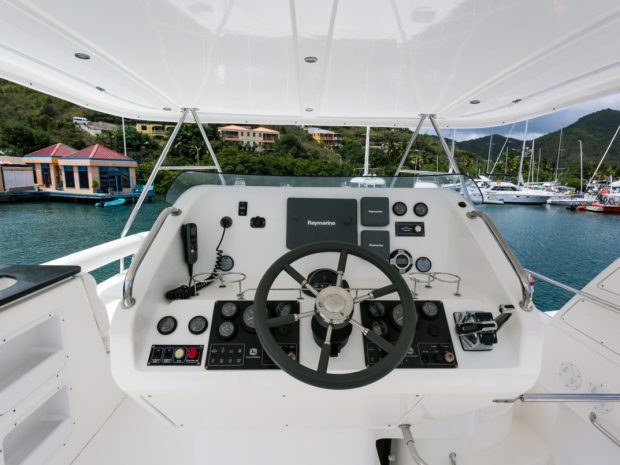 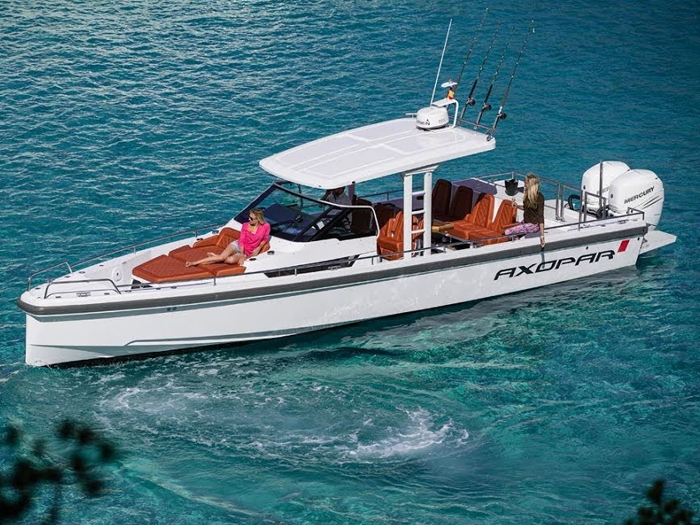 A centrally positioned helm station offers excellent all-around visibility for ease of maneuvering, and it’s equipped with a large color chartplotter, VHF radio, depth-sounder, and speedometer. 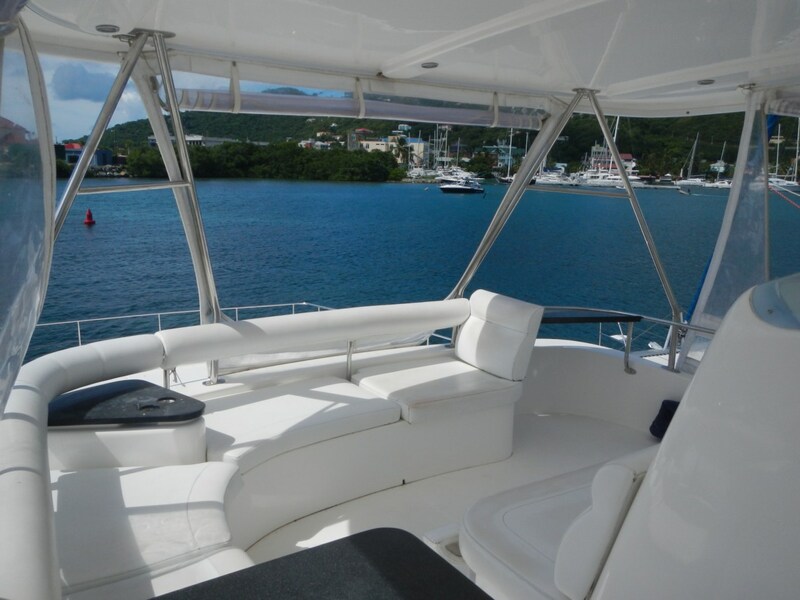 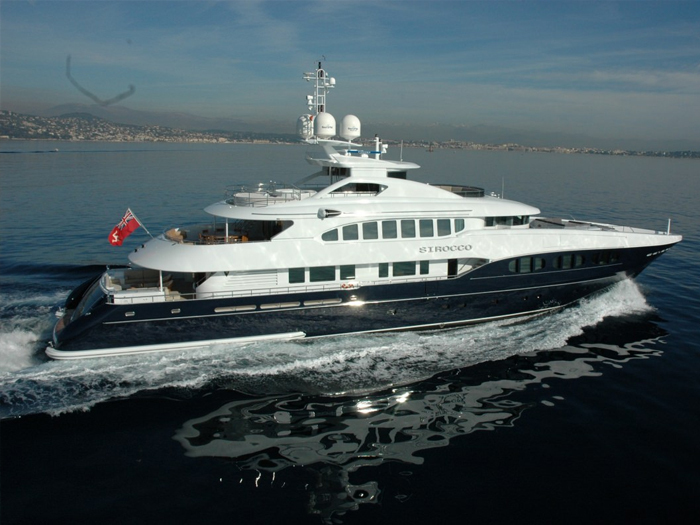 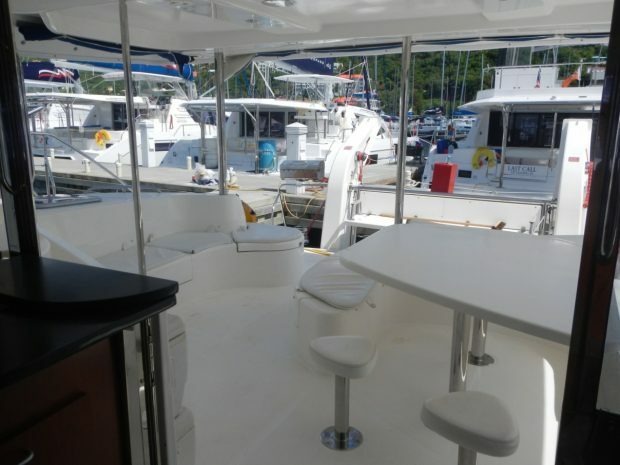 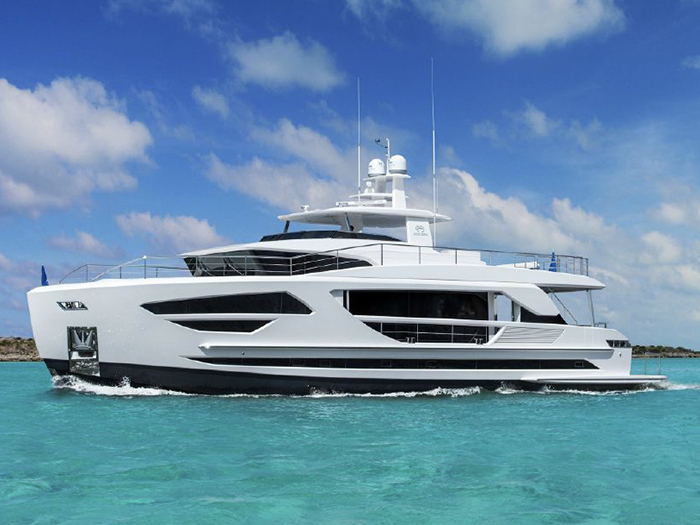 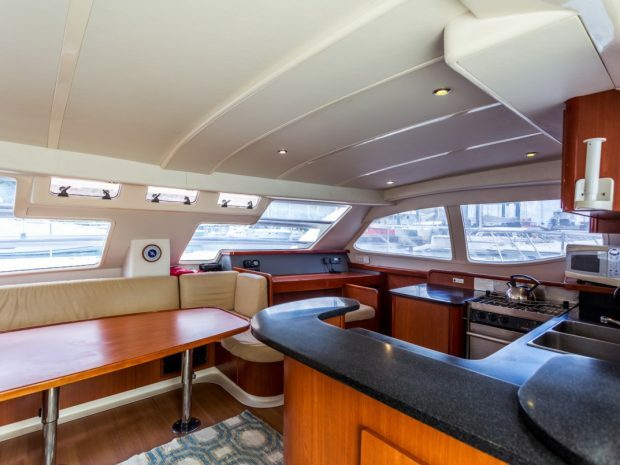 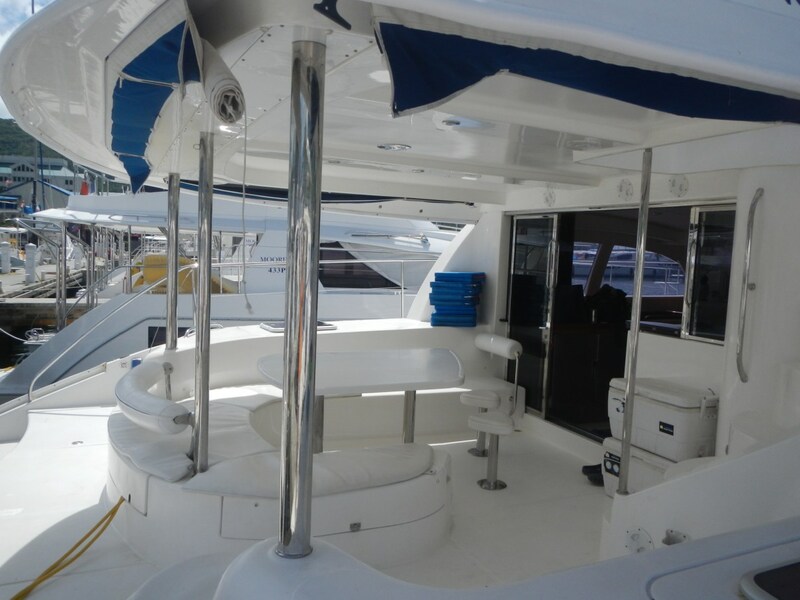 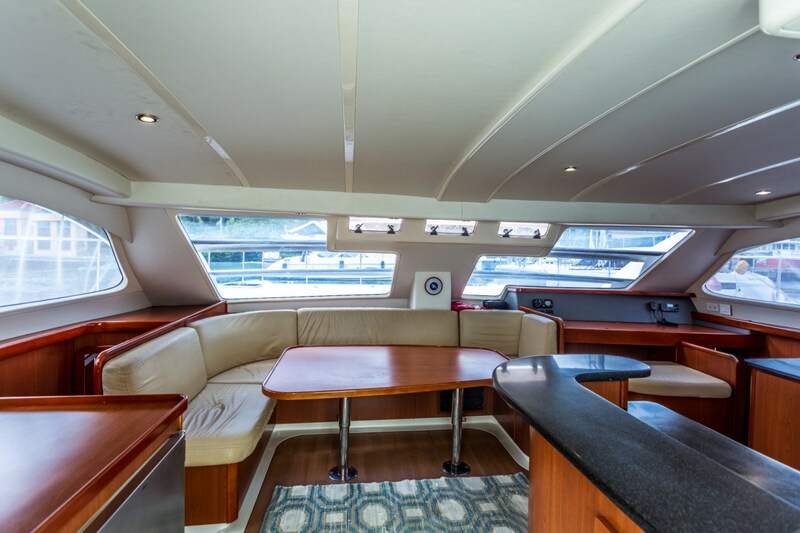 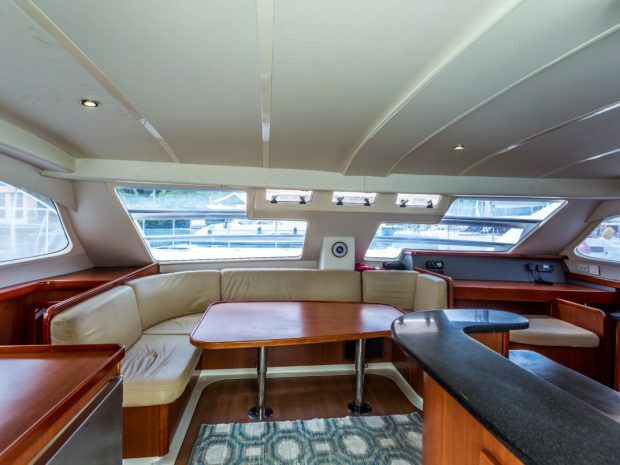 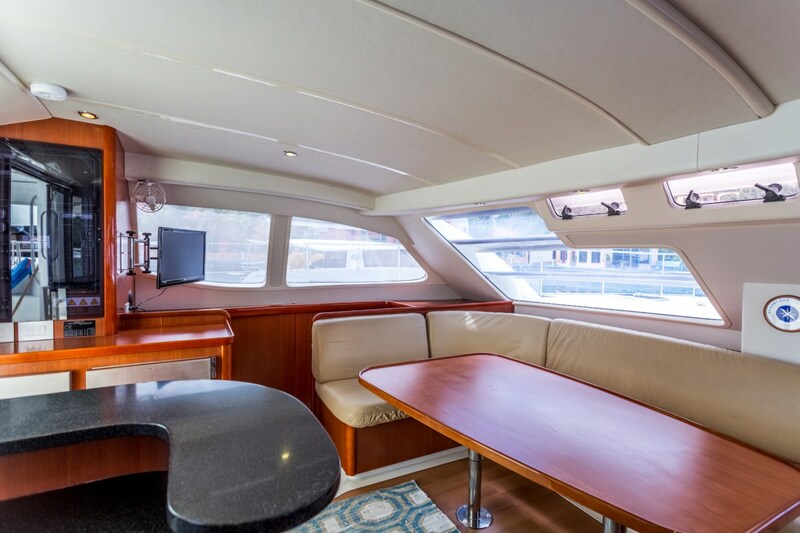 Forward of the helm station are built-in, wrap around seating areas with cocktail tables and a wet bar. 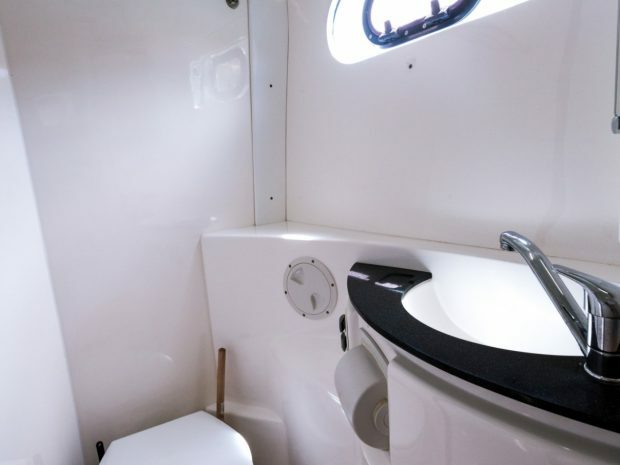 This design allows all the guests to sit up top with the captain while underway. 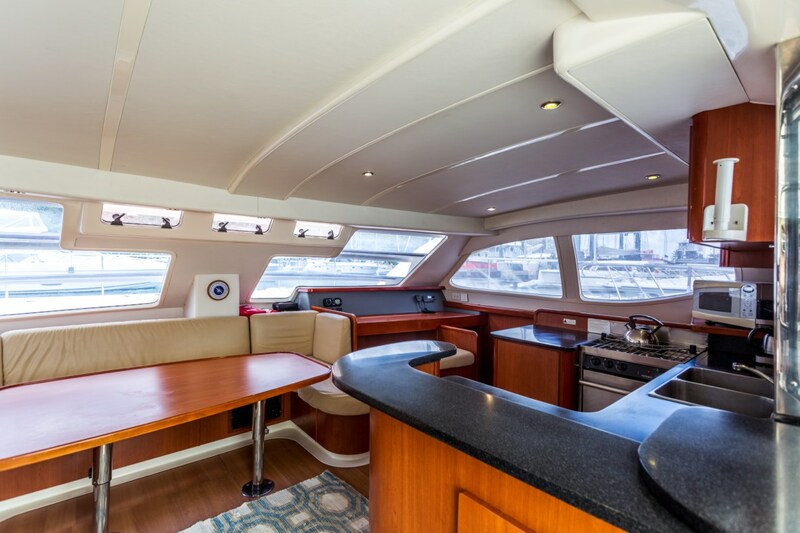 The main deck features an open-concept layout, with outdoor and indoor dining areas separated by a large sliding glass door. 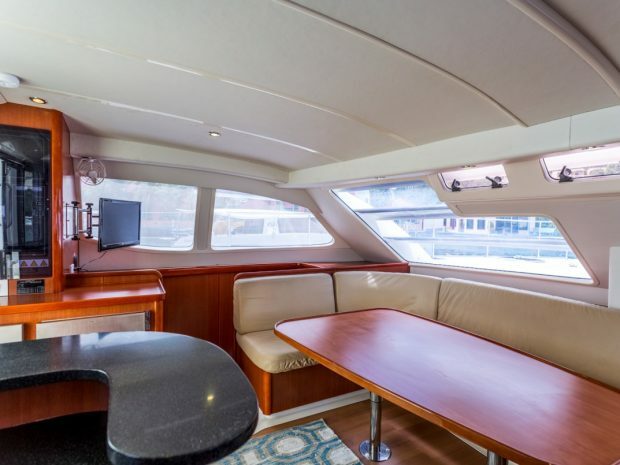 Inside there is a spacious saloon with forward-facing navigation station, a fully equipped galley with a serving window to the cockpit area. 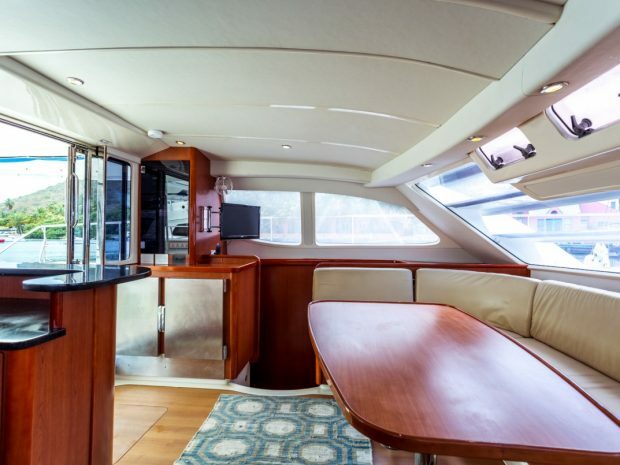 Sleek windows along the sides of the coach roof add to the elegant look of the deck and give the interior a light, voluminous feel, while louver steps on the foredeck shade the saloon. 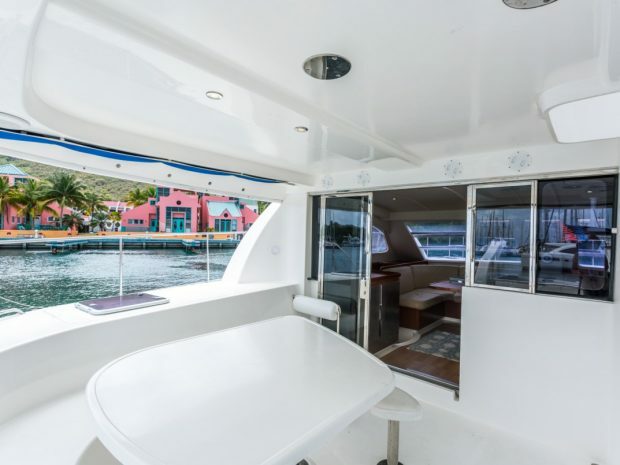 The layout is clear and uncluttered with wide side decks, walk-through access to the aft swim platforms, a fitted propane barbecue, and an aft bench that converts into a swim platform. 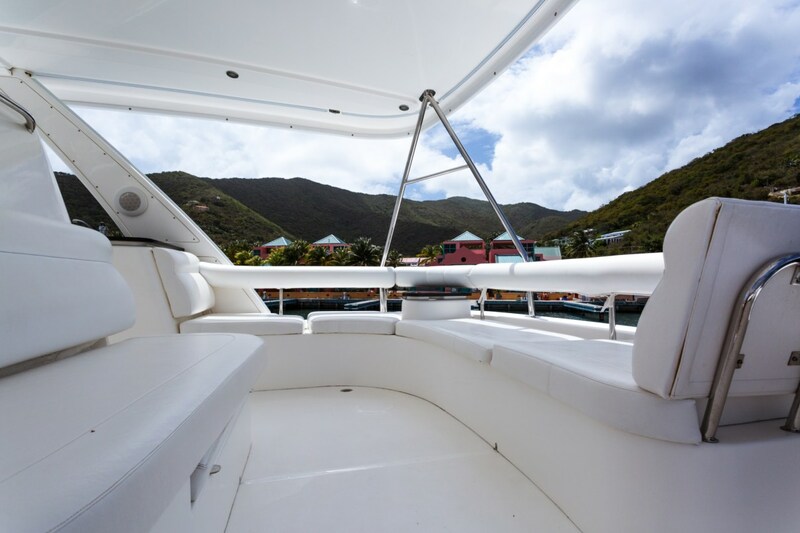 Aft-mounted davits allow for safe and easy stowage of the dinghy. 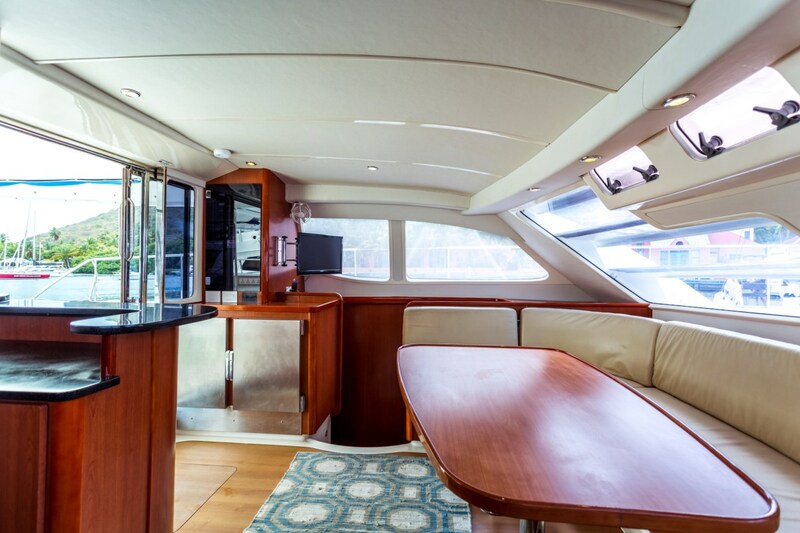 The huge foredeck with louvered steps offers additional lounging and seating areas. 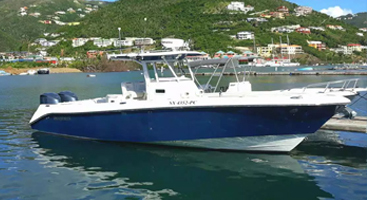 The power catamaran ‘Jenica’ is fully air-conditioned and has a generator. 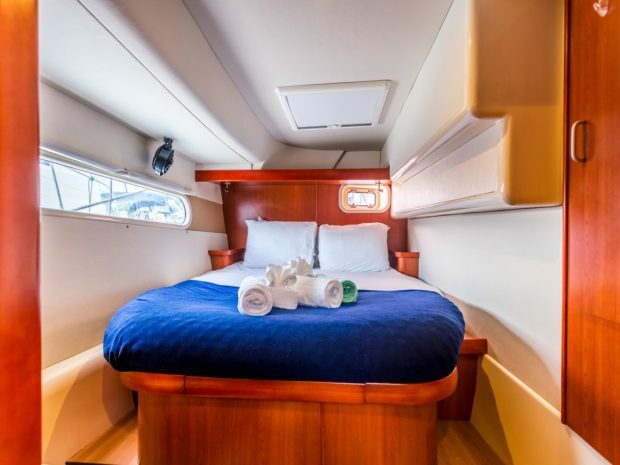 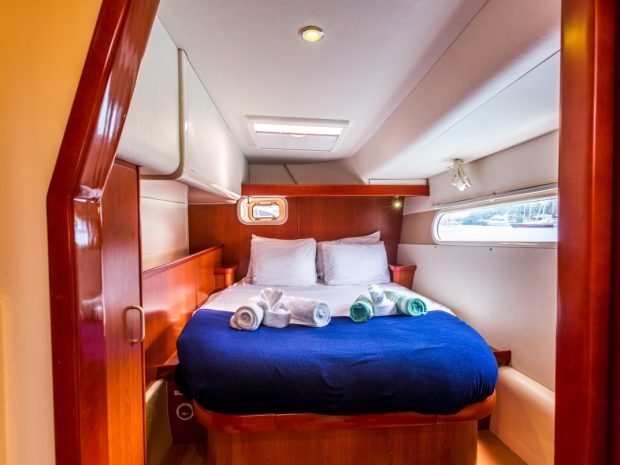 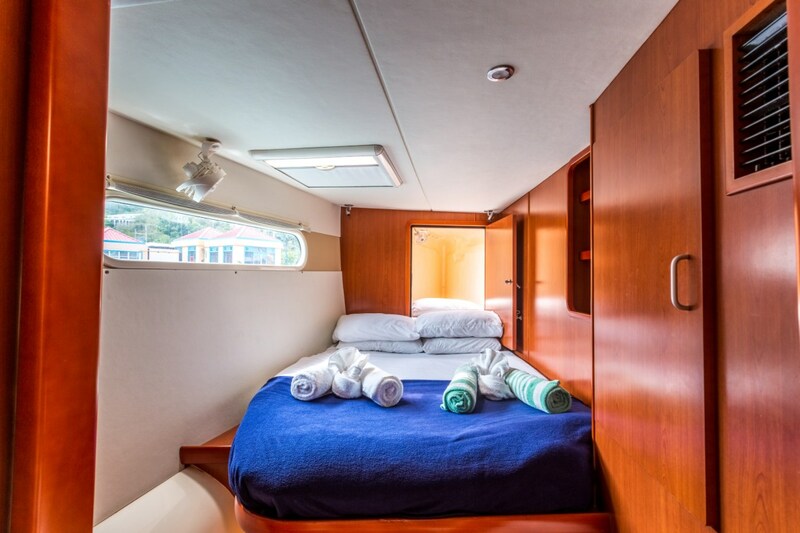 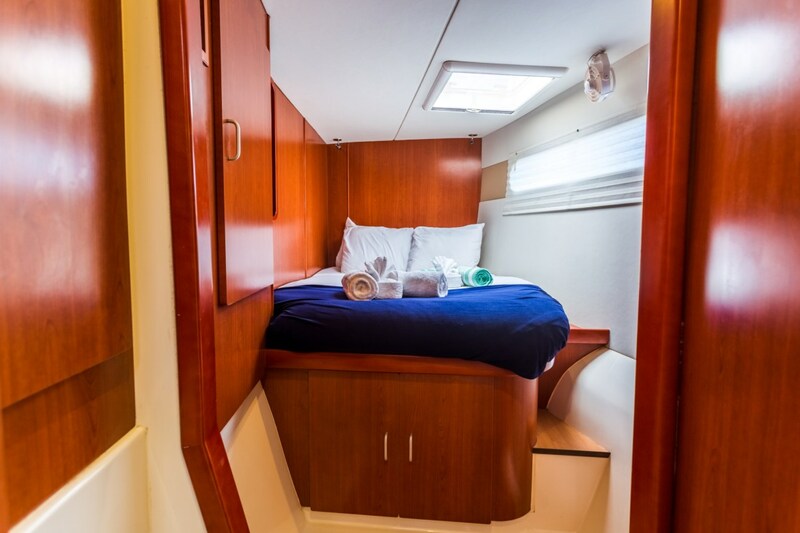 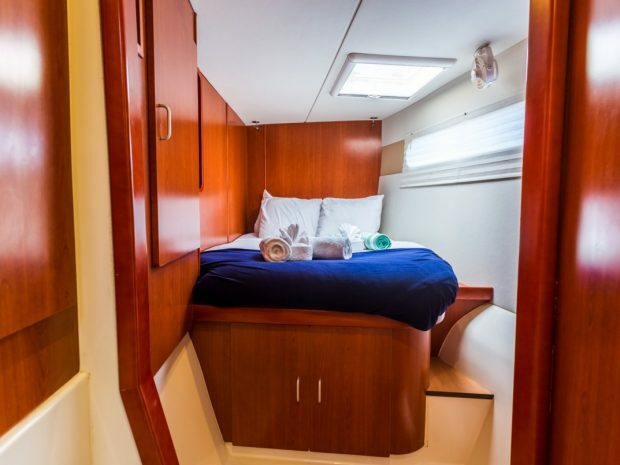 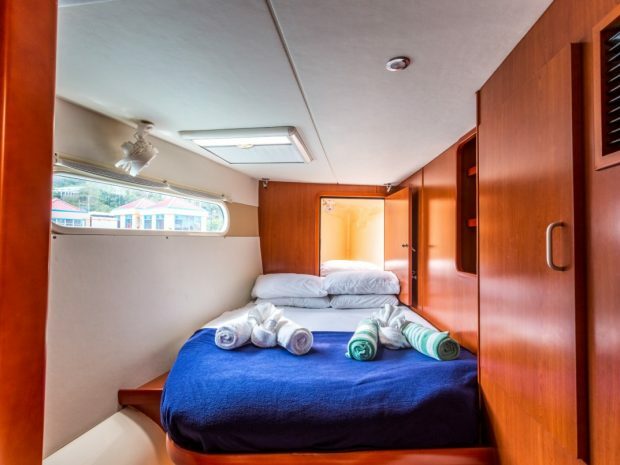 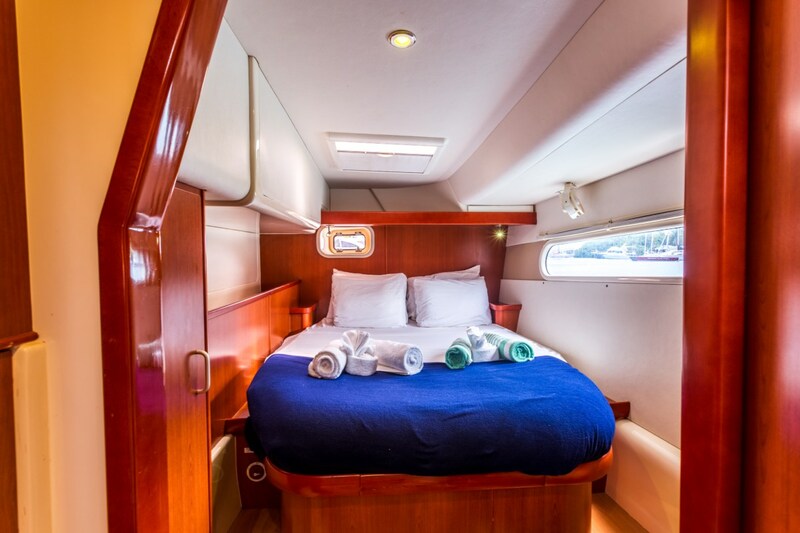 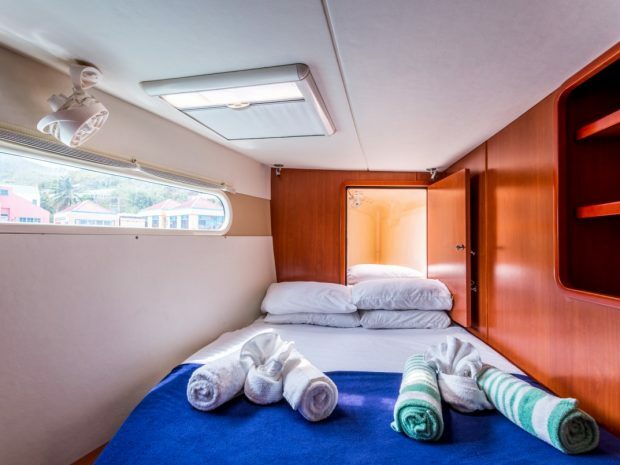 Below the main deck, the hulls of the power catamaran house four comfortable full-sized cabins, each with queen beds. 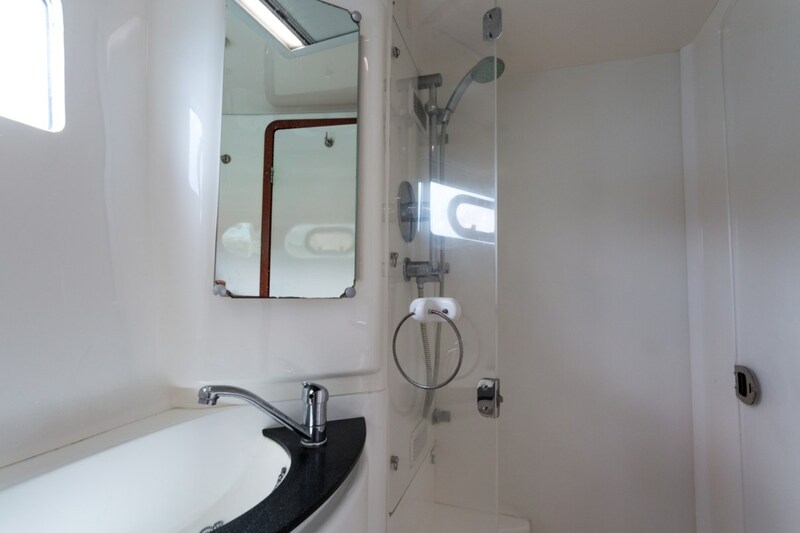 All four cabins have their own en-suite baths, each with separate shower and electric heads, providing a comfortable retreat for all guests. 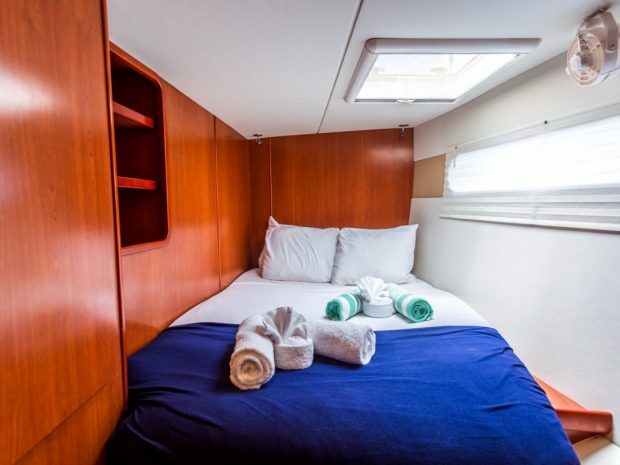 ‘Jenica’ also has a convertible saloon which offers sleeping arrangements for up to two guests. 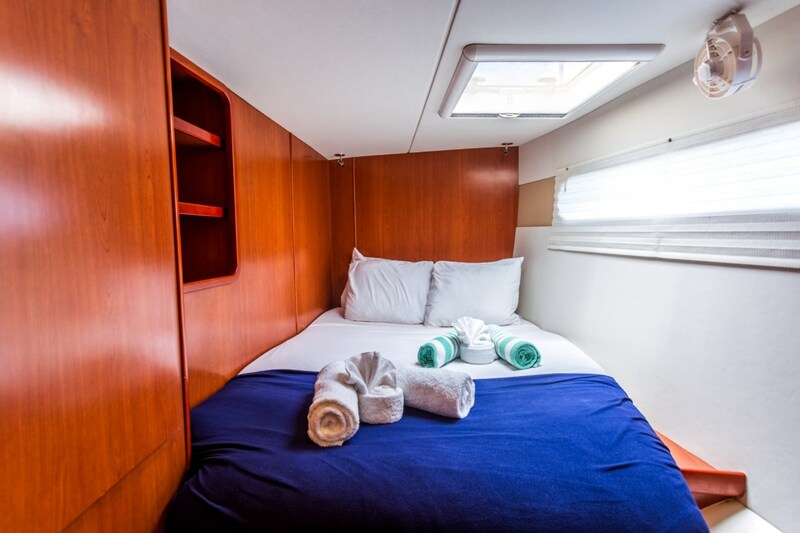 This space is included as a double berth in the maximum capacity of your yacht. 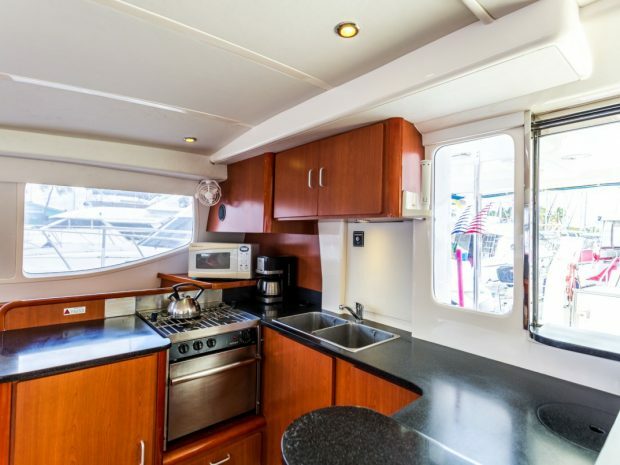 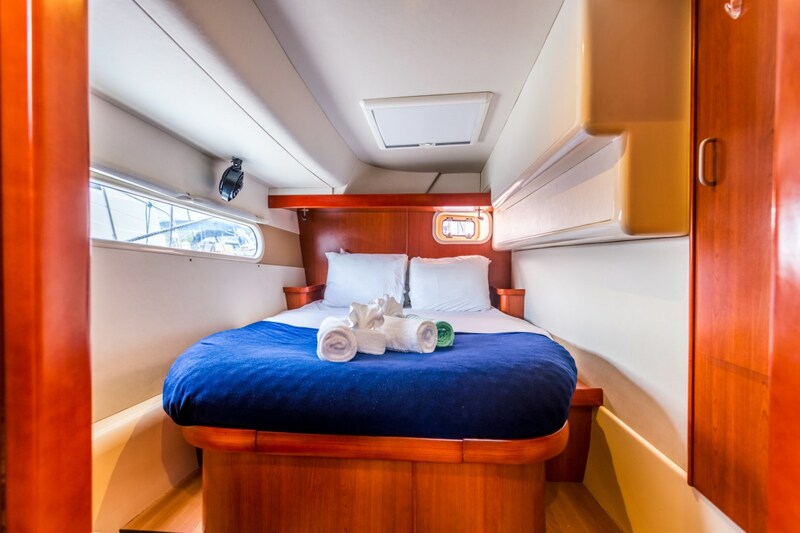 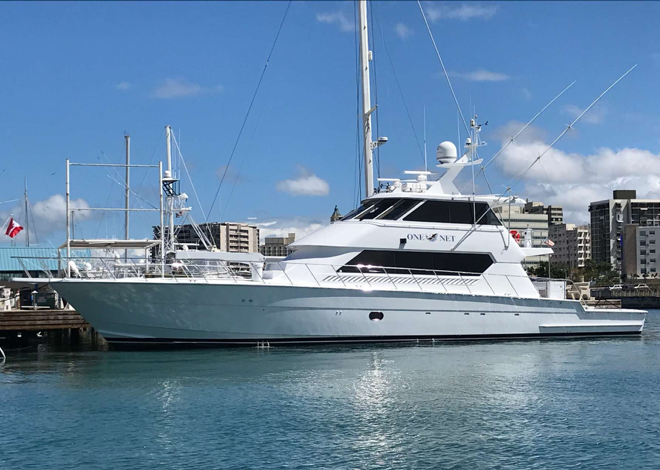 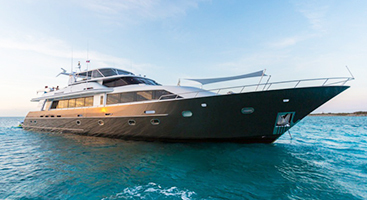 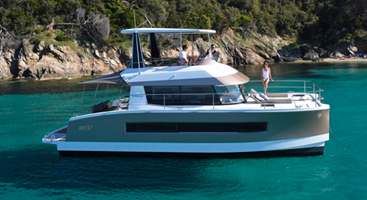 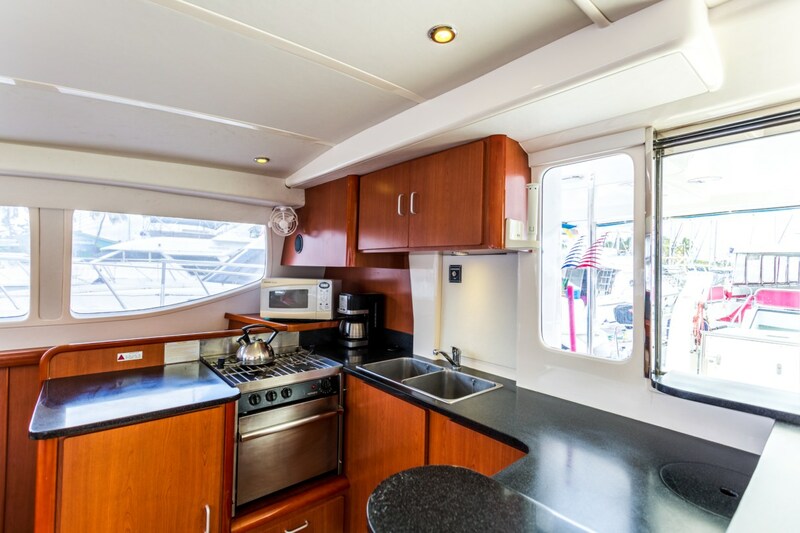 The spacious Leopard 47 can accommodate a maximum of 12 guests (depending on your guest make up and if using all sleeping spaces), across 4 double cabins, 2 single cabins (non air conditioned and accessed from the top deck, typically only used by crew) and a convertible dining salon. 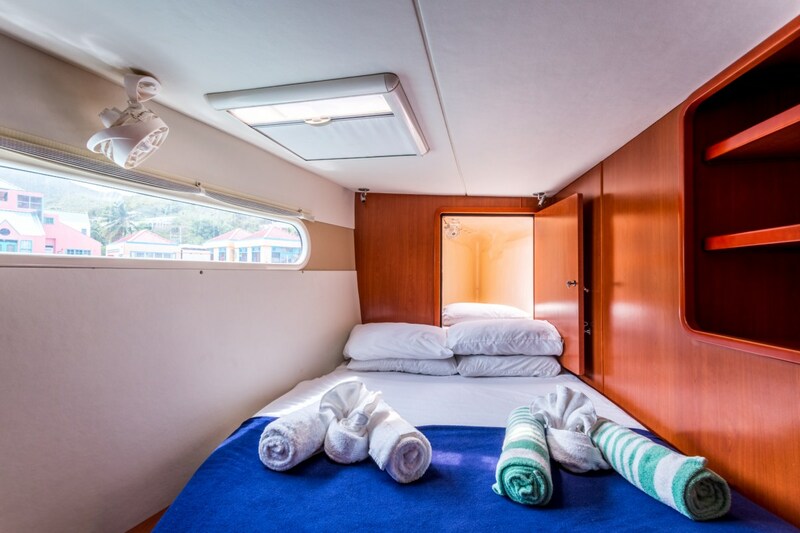 Below the main deck, the hulls of the Leopard house four comfortable full-sized cabins, each with queen beds. 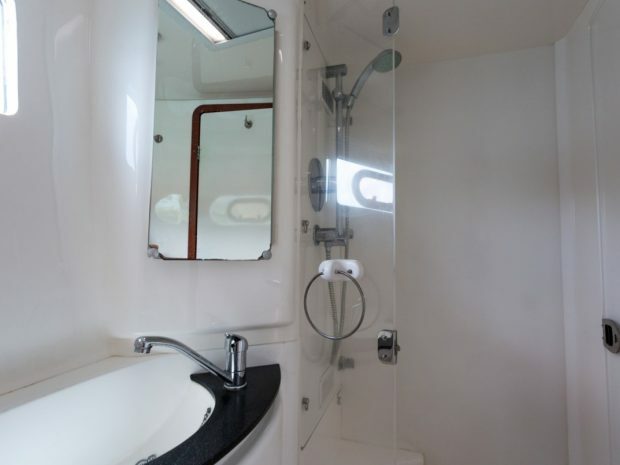 All four cabins have their own en-suite baths, each with separate shower and electric heads, providing a comfortable retreat for all guests. 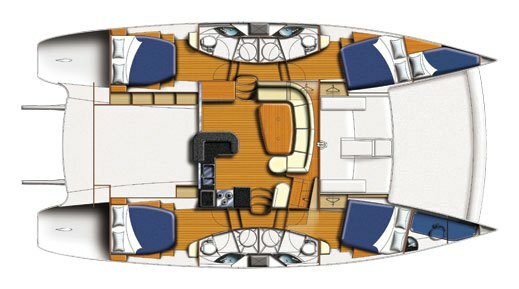 The Leopard 47 also has a convertible saloon, which offers sleeping arrangements for up to two guests. 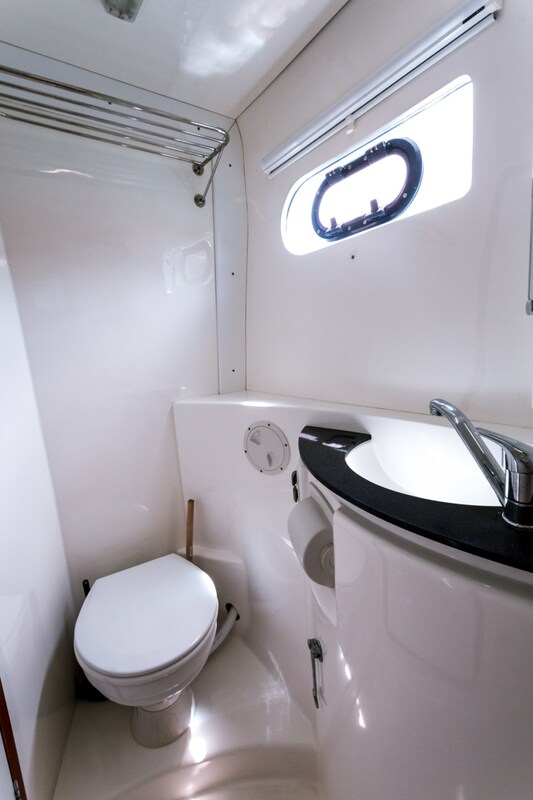 This space is included as a ‘double berth’ in the maximum capacity of your yacht.